The chrysanthemum (菊花) and denomination 1000. About this flower, please, read reverse description! Children, pupils of primary classes, are looking at the globe. In the background, on the right, you can see the girl at the microscope. And in the background, in the center and left, you can see a telescope and a starry sky. Below is the globe. Education in Taiwan is given great attention. Traditionally in China, education has always been highly valued, and educated and learned people were respected members of society and held high social status. At present, considerable funds are spent on education in Taiwan. The costs of education, science and culture make up about 6.5% of the GNP of the island and exceed 17 billion US dollars. Thus, for one Taiwanese for this purpose, about 619 dollars are allocated per year. The development and improvement of the education system in Taiwan over the past half century is certainly one of the key factors in its successful economic development. Reform of the education system on the island contributed to the modernization of Taiwanese society. The increase in the educational level of Taiwanese has made it possible to successfully switch from the production of labor-intensive consumer goods to the production of high technology products and to take the third place in the world after the United States and Japan in the production and sale of computers and other high-tech products of the information and electronic industry. The issues of education in Taiwan have always been given great importance. According to the Constitution, all citizens of the island have equal opportunities for education. Education costs should constitute a certain proportion of the budget at each of the three administrative levels: central, provincial and local. The right to free school education, free textbooks for children from poor families and subsidies for education to poor areas are secured. In 1968, Taiwan introduced a mandatory nine-year education system, which was to cover all school-age children from 6 to 15 years old. There is also a wide range of different educational opportunities for the population of all ages. The illiteracy rate in the island now stands at about 5%, whereas in 1952 almost 42% of Taiwan's population could not read or write. Such progress was achieved through the introduction of a system of free education that made education accessible to all and provided the basis for in-depth training. In 1949, there were a total of 1,529 educational institutions of all types in Taiwan, including 28 kindergartens, 1,231 elementary schools, 147 secondary schools, 8 regular schools and 82 schools with a professional bias, as well as 4 lower-level colleges, 3 colleges, 1 university, 2 special and 23 schools of additional education. By 1968, the number of educational institutions had increased almost 3-fold - to 4,480, secondary schools were divided into lower and second-level schools, and the number of colleges and universities increased to 140. In 1977, five colleges and universities received the status of "open" which meant easier entrance exams and flexible hours for those who did not have the opportunity to attend classes at regular school hours. The system of school education begins with preschool education. In Taiwan, there is a system of two-year pre-school education, which is designed for children 3-5 years. It is received by almost 40% of children of this age group, 25% of children attend kindergartens and another 15% various preparatory courses. Nevertheless, the number of children enrolled in pre-school education in Taiwan is significantly lower than in developed countries, where this figure is 80-90%. In this regard, the goal is to increase the number of children enrolled in pre-school education programs to 80%, for which it is proposed to expand the number of preschool educational institutions by transferring them to existing primary schools and thereby utilizing the existing school opportunities, as well as supporting kindergartens . The system of compulsory 9-year school education includes a 6-year primary education, as well as 3 years of secondary education of the first stage. Currently, more than 99% of children of the corresponding age attend general education schools. In 1950, of all the children of school age, less than 80% attended primary school, only 40% completed high school. Currently, almost a quarter of the population of the island visits any educational institution. In the early 50-ies, this figure was only 13.9%. 50 years ago, only 3.7% of the population had higher education, and 94% of students completed their studies in secondary schools. Now almost 95% of graduates of schools with a nine-year education continue their education in schools with secondary education classes of 3-year secondary education or in vocational schools. After their graduation, students receive a completed secondary education. To enter the secondary school or the vocational school it is necessary to pass examinations in certain subjects. Selection takes place on a competitive basis. Denominations in numerals are in top and lower left corners. In words - lower, right. 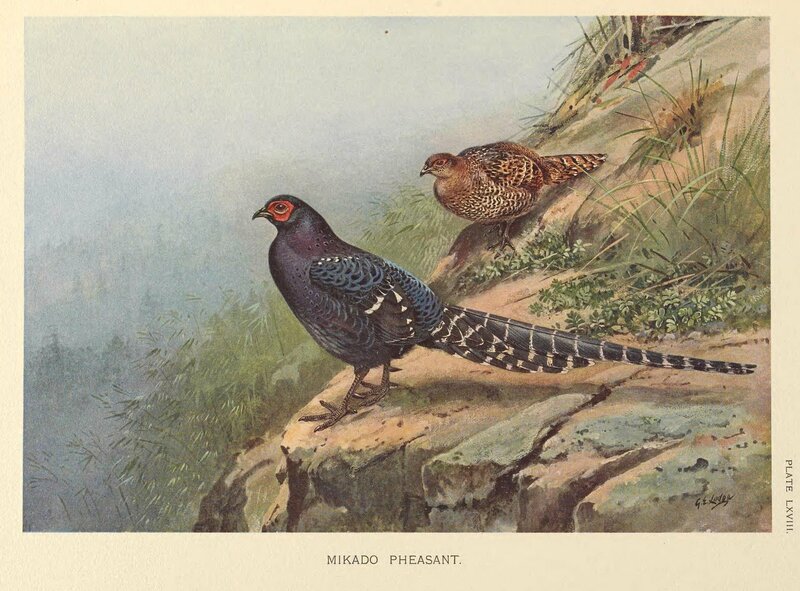 The Mikado pheasant (Syrmaticus mikado) is a gamebird in the pheasant family Phasianidae of the order Galliformes, gallinaceous birds. Sometimes considered an unofficial national bird of Taiwan (along with the Swinhoe's pheasant and Taiwan blue magpie). 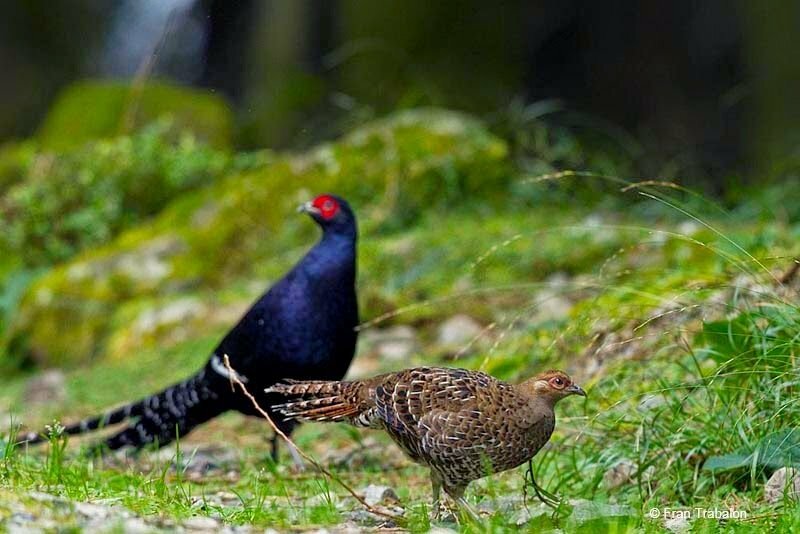 The Mikado pheasant is endemic to mountainous regions of Taiwan. The species occupies dense shrubs, bamboo growth and grassy terrain with conifer overstory in central and southern Taiwan, from 2000 to 3200 meters above sea level. With the tail included, male of this species get to be up to 70 cm. in body length, while the smaller females measure up to 47 cm. The male is dark with plumage that refracts with blue or violet iridescence, with white stripes on its wings and tail. The female is brown and specked with brown and white quills. The long and striped tail feathers of the male were used by the Taiwanese aborigines as a head-dress decoration. The type specimen of the pheasant comprises two such tail feathers obtained in 1906 by collector Walter Goodfellow from the head-dress of one of his porters. It was named in honour of the Emperor of Japan, of which Taiwan was occupied by. Its Chinese name, 帝雉 (dizhi) also translates to "Emperor Pheasant." On background is The "roof of Taiwan" - Yushan Mountain (玉山). Yushan (Chinese: 玉山; pinyin: Yù Shān; literally: "Jade Mountain"), also Mount Jade or Mount Yu, is the highest mountain in Taiwan at 3,952 meters (12,966 ft.) above sea level, giving Taiwan the fourth highest maximum elevation of any island in the world. The obsolete name of Mount Morrison is thought to have been named in honor of the 19th century missionary Robert Morrison. 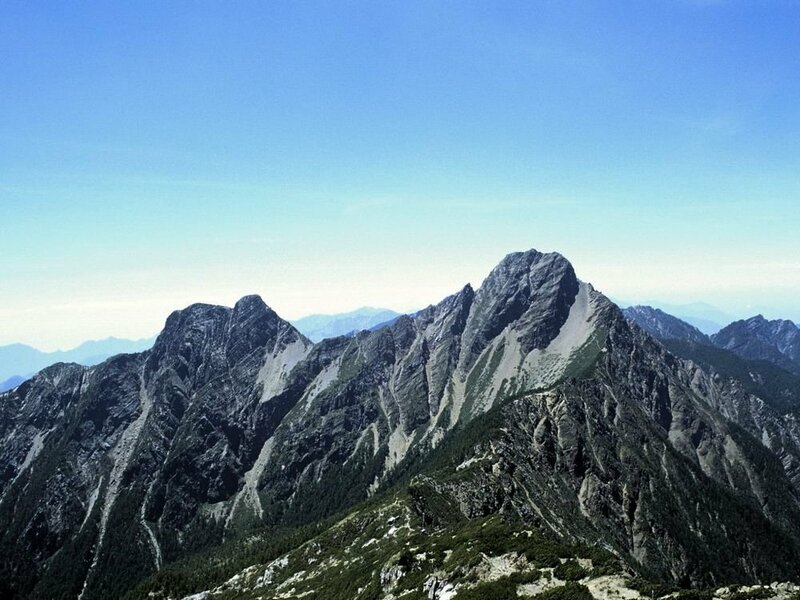 Today, the mountain is generally referred to as Yushan or Mt. Jade. Yushan and surrounding mountains belong to Yushan Range, which is part of Yushan National Park. The national park is Taiwan's largest, highest and least accessible national park. It contains the largest tract of wilderness remaining in Taiwan and is also valued for its pristine forests and fauna diversity, including many endemic species. The highest point of Yushan Range, Yushan, is 3,952 meters (12,966 ft.) above sea level, and is the highest point in the western Pacific region outside of the Kamchatka Peninsula. Yushan was once in the ocean and raised to the current height because the Eurasian Plate slid over the neighboring Philippine Sea Plate. The ocean waters off Taiwan's east coast are deep; in fact, submarine slopes plunge down to the Pacific Ocean at a grade of 1:10 and the ocean reaches a depth of more than 4,000 meters (13,100 ft.) about 50 kilometers (30 mi.) from the coast. In lower left corner is Jade Mountain Thistle (Cirsium kawakamii, 玉山蓟). This plant belongs to the genus Compositae, and is endemic to Taiwan. The people called "chicken spike." Distributed on the island of Taiwan, grows at an altitude of 3000-3300 meters above sea level in the regions of "alpine meadows". 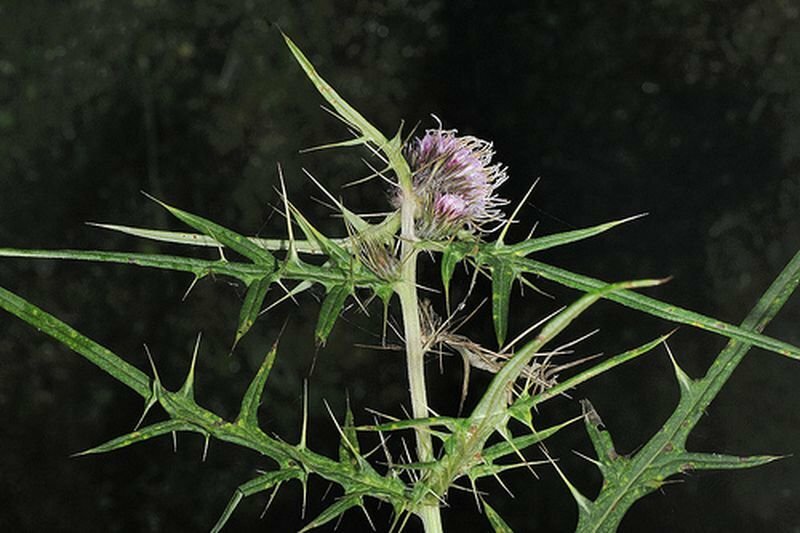 Chicken thorn is considered a medicinal plant. Farmers grow it in large quantities, like tea. According to the central bank of Taiwan - a small plant motif, printed in the lower left corner of the banknote of $1000, is a "Thistle from a Jade Mountain" Yushan. In top right corner is The florist's daisy (Chrysanthemum morifolium, 杭白菊). 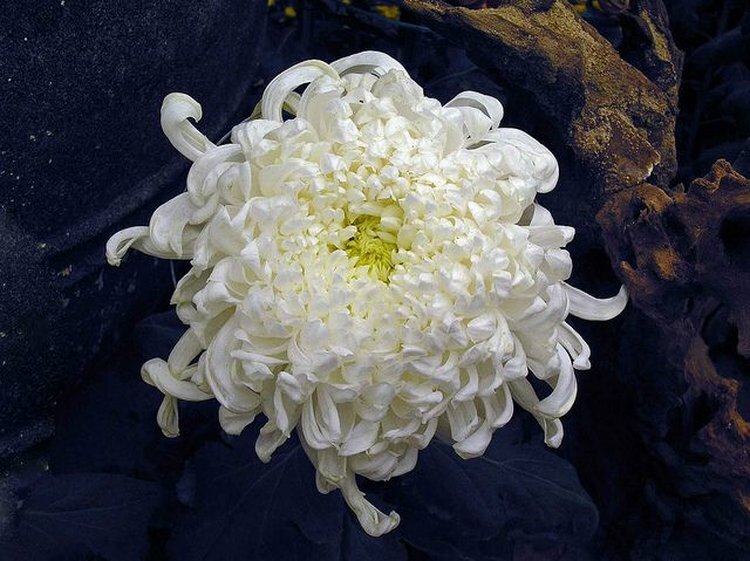 Chrysanthemum at all times has been a favorite flower of the Chinese, as it continues to bloom until late autumn, when all other plants have already faded. Moreover - chrysanthemum is a riot of colors, challenging the coming winter. This flower symbolizes autumn, as well as cheerfulness of the spirit before the coming rainy, solitude. This flower is a symbol of sublime solitude. Unlike the spring flowers, flexible and charming, the chrysanthemum symbolizes the "later fragrance" - a venerable maturity, the departure from the world to sublime solitude ("hermit, pouring late flavor"). In upper left corner is the sunrise - view from Yushan Mountain. At the bottom is an inscription, which says, that this banknote was printed in 2004, 93 years after 1911 - the year of proclamation the Republic of China. Denomination in numerals is in top left corner. In words - in lower right corner. First introduced on July 3, 2000, the banknote was found to have contained several factual discrepancies that was subject to criticism. The globe that the children were surrounding appears to be a mirror image, possibly resulting from an invert error. The background shows a 45 degree angle labeled as 60 degrees. Accordingly, the Central Bank of China relaunched the banknote with a holographic strip with the two errors rectified and the globe now rotated to the 140th meridian east on July 20, 2005. NT$1,000 banknotes without the holographic stripe have been recalled and withdrawn from use on August 1, 2007. As of October 1, 2007, only the Bank of Taiwan (now the Central Bank of the Republic of China) accepts such notes.